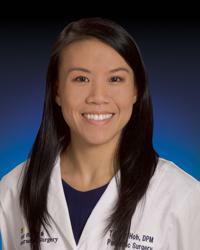 Tiffany Kit Hoh, DPM, is a podiatric surgeon practicing at MedStar Good Samaritan Hospital and MedStar Franklin Square Medical Center. Dr. Hoh earned a doctorate of podiatric medicine (DPM) at the California School of Podiatric Medicine in Oakland, California. She then completed a three-year podiatric medicine and surgery residency with an added credential in reconstructive rearfoot/ankle surgery (PMSR/RRA) at MedStar Washington Hospital Center. Dr. Hoh has received specialized training in diabetic limb salvage at MedStar Georgetown University Hospital’s Center for Wound Healing. She treats many foot and ankle ailments, focusing on complex lower extremity wounds, diabetic limb salvage, sports injuries, and foot and ankle reconstructive surgery. Having completed 18 years of ballet training, she has a particular clinical interest in dance medicine. Dr. Hoh is board qualified with the American Board of Foot and Ankle Surgery (ABFAS). She is an associate member of the American College of Foot and Ankle Surgeons (ACFAS) and a member of the American Podiatric Medical Association (APMA). Dr. Hoh is fluent in English and Cantonese. "My goal is to provide the highest quality of care to my patients. I strive to listen and understand my patients in order to personalize their care and treatment."